For my full coverage of the 2014 NYFF see also FILMLEAF. Clouds of Sils Maria is an accomplished, well acted, but labored and self-conscious film created by Olivier Assayas for Juliette Binoche. Maria Enders, her character, is a famous forty-year-old actress who's asked to take on the role of the older woman in a revival of a play called Maloja Snake, in which twenty years earlier she played the younger one, Sigret, a springboard to fame for her then. In the play, the young woman is an assistant to the older one, and a lesbian affair develops and the cruel, manipulative Sigret dumps her boss, driving her to suicide. As she debates taking on this less flattering role, Maria practices her lines with her twenty-something personal assistant Valentine (Kristen Stewart), with whom she has a relationship not lesbian, but perhaps too familiar and competitive to be properly professional. Meanwhile the actual part of Sigret in the revival is offered to a cocky and controversial young media superstar, Jo-Ann Ellis (Chloë Grace Moretz, the only actor who brings any humor to the screen). While issues of today's even more media-dominated world press upon Maria with interviews, awards ceremonies, fashion shoots and the like, Chloë Grace Moretz's Lindsey Lohan-like character turns out to be both scandalous and smart, if not necessarily wise: she's dating a hip, handsome young English writer called Christopher Giles (Johnny Flynn) whose wife attempts suicide as a result. Most of the action takes place in the Swiss Alps. Both "Sils" and "Maloja Snake" refer to the alpine region from whence comes the author of the play, understandably an idol of Maira Enders', whom she and Val were coming to a ceremony in honor of, but then dies just before they arrive. Assayas has said he originally thought of using Fassbinder's The Bitter Tears of Petra von Kant as the play, then decided to use a simpler version of the story of his own invention. Clouds of Sils Maria has a great deal of gloss, but its over two hours' length could have used some cutting. There is much drinking and smoking and forced laughter between Val and Maria, yet their dialogue isn't as sharp or as revelatory as it might have been, despite being over-explanatory. Binoche's slightly artificial manner when acting in English underlines this. Some of the alternations between acting and being are cool, though. The revelation of the film, however, is Kristen Stewart. Hitherto branded as a mere pop-culture creation for her part in the mostly execrable "Twilight" series movies, she's the best thing here, articulate and smart, her naturalness in interacting with Binoche making Binoche look better. Who knew that, if given material as intelligent as this, she would take it on with such ease and fluency? This should open up Stewart's career to more sophisticated roles now, including more European ones. Mike D'Angelo points out in his Cannes review in The Dissolve that this brings together elements of two of Assayas's (key?) previous films: the "knowing film-world milieu" of Irma Vep, and the "poignant juxtaposition of generations" of Summer Hours. D'Angelo calls Sils "a typically smart, incisive, beautifully crafted analytical exercise" for Assayas, but notes that it's "too carefully worked out to be particularly intuitive." More than that, it's too pleased with its own cleverness and more heavy handed and self-important than it ought to be, and it relies on a plot structure whose parallelisms are overly self-conscious. Some other elements aren't quite right. For all Assayas' elaboration of dialogue (and the line practice between Val and Maria goes on and on), the film's structure feels in some ways clumsy. Binoche isn't forty as Maria's supposed to be but fifty, of an age past the middle-age self-doubt of her character. Toward the end, Stewart's character simply disappears after an incident in the mountains: there's no transition. Among the excesses (too much of some secondary characters, like the play director) there are glimpses of the play revival, with an over-elaborate, ultra-modern set inexplicably and unnecessarily containing a bevy of minor characters -- or are the stagehands? This film is (in current parlance) "layered," but its self-reflexiveness and dark-mirror parallelisms aren't particularly subtle. As in Kiarostami's Certified Copy, also starring Binoche in self-conscious English, this is a European art house film reveling in its literary contrivance but only momentarily (when Stewart or Moretz are talking in some scenes) coming to life. Apart from all the travelogue shots of mountains, fog, and clouds to surging music, for the most part this feels more like a stage play than cinema. 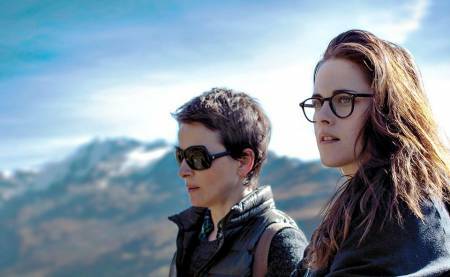 Clouds Of Sils Maria , 124 mins., debuted at Cannes, shows at various other festivals. Screened for this review as part of the 52nd New York Film Festival. At the Q&A for press, Kristen Stewart again showed herself to be notably confident and smart. It was disappointing to find Binoche and Assayas seeming to refer to Summer Hours, a lovely, humanistic work, as if it somehow wasn't a real movie but Sils Maria is. Sils does certainly attempt to delve more into the world of women's feelings, which is what Binoche wanted. But the media stuff (and particularly all the references to tablets, smart phones, social media and paparazzi) adds little profundity or relevance. The film came out in France (as Sils Maria) 20 August 2014 and got good reviews (AlloCiné press rating 3.8): the interplay of "art" and "life" was approved of. This may be a better film to talk about than to watch, but ambitious it certainly is. US release began 10 April 2015 (IFC Center NYC).